How Far is PBEL City? Majestically rising in Peerancheru buckled up with lush green gardens spread over the area with a view of the places around. creating a stress-free and pollution-free environment where you can spend the quality time with loved ones. A premium housing project launched by PBEL, City in Appa Junction Peerancheru. Among the many luxurious amenities that the project boasts are Fire Fighting System, Car Parking, 24 X 7 Security, Banquet Hall etc. The ambiance of PBEL City is truly a marvelous sight to behold. PBEL City is one of the best investments in Residential properties in Hyderabad. PBEL City offers beautiful 2,3 BHK Apartments in Hyderabad. 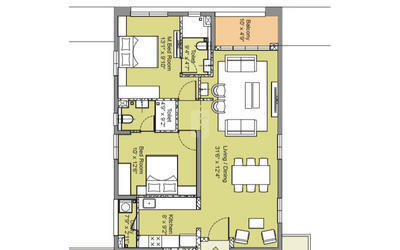 The price of Apartments in Appa Junction is ideal for the home-buyers looking for a property in Hyderabad. The project offers 2,3BHK flats for sale in Hyderabad with best amenities where 2BHK flats super built-up area size varies from 1180 Sq ft to 1400 Sq ft, and with more rooms 3BHK flats super built-up area size is 1534 Sq ft, 1972 Sq ft.
PBEL City is now home to many happy customers. the vibrant community of residents enjoys a life of convenience as all amenities are fully functional. PBEL City combines INCOR's vision for the new Indian family with L&T's expertise. 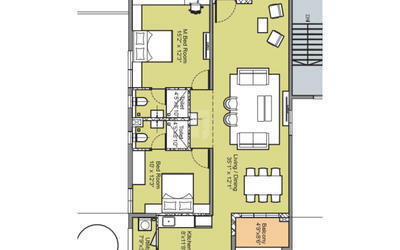 The township offers a wide variety of floor plans; each home is built with high-quality materials. Structure designed with load bearing concrete shear walls and flat slabs. Designed considering earthquake zone of the region (Hyderabad). Internal Walls/Ceiling: Internal walls and ceiling painted with Asian paint acrylic emulsion of approved colour or equivalent. External Walls: Weather-proof exterior grade paint of approved colour/texture or equivalent. Nitco Vitrified tiles flooring in drawing/living/dining, bedrooms, kitchen or equivalent. Nitco Ceramic floor tiles in bathrooms, tile dadoing, kitchen, utility and washbasin near dining or equivalent. Nitco Vitrihed tiles in other common areas/corridors or equivalent. Main doors with wood door frame and polished flush shutters of Nikki brand or equivalent. SS hardware of Dorset brand or equivalent. Teak wood door frame and membranes pressed or flush shutters with paint finish. UPVC Kommerling Germany framed glazed sliding/ openable doors for balconies with toughened glass or equivalent. UPVC Kommerling Germany framed glazed sliding/ openable shutters with toughened glass or equivalent. Granite work top with S.S sink. Glazed tiles above the kitchen platform 600mm high. 5 power points in kitchen with mint-pin 6/16A sockets. Piped Gas System with M.S. Pipe. PVC insulated Lapp wires in PVC conduits. DBs with MCB and ELCB in each apartment for safety. Lighting arrester for the tower and aviation lamp. TV outlets in master bedroom and Wing/ drawing room. 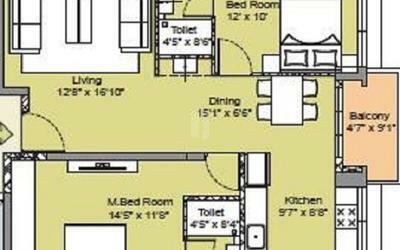 Telephone point in master bedroom and living/ drawing room. Ceramic ware of ROCA brand or equivalent. CP fittings of GROHE brand or equivalent. MS painted railing for staircase and balconies. S.S. finished lift cars and doors for 3 no.s passenger elevators per tower. One no. stretcher or goods lift for each tower with MS paint finish (1.5m/sec). Automatic sprinkler system at basement, lobby, flats and corridor. Public address system and fire alarm system. Portable fire extinguishers in common area. Common area lighting supported by inverter for an uninterrupted power supply. Municipal connection from HMWSSB or borewell water supply through Water Softener Plant. Waste water treated by STP and treated water for gardening and WC flushing.